Our Honda dealership in the Ballwin, O’Fallon, and St. Peters has provided quality car service in St. Louis since 1965. Our experts use high-tech equipment and up-to-date technology to ensure that your vehicle is getting the quality it deserves. I can not say enough good things about St. Louis Honda, especially Rob Carroll! The employees are top notch. Everyone is so friendly and helpful and go above and beyond to make your experience at the dealership pleasant. This is my 3rd Honda Accord, the last 2 of which I purchased from Rob. He's honest, personalable, conscientious, and continues to find the perfect car for me every time. My mom also purchases her SUVs with Rob. We think he is truly the best sales consultant we've both ever had. Collectively over the past 9 years we have bought 4 cars with Rob. Any Honda I purchase will always be from Rob and I will always send friends or family looking to purchase a Honda his way! Also thank you to Jim Davies and Beverly Nahlik for the entertaining and lively conversations! 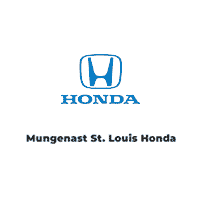 Welcome to Mungenast St. Louis Honda! Since 1965, the employees at Mungenast St. Louis Honda are ready to help you purchase the New or Certified Pre-Owned Honda in St. Louis you’ve been waiting for! Whether you’re interested in purchasing a new or used Honda near St. Peters, or parts and service, our staff is dedicated to serving your every automotive need. Visit us today by following directions on our Contact Us page. We’re conveniently located in South County, just minutes from I-270, I-44, I-55 and I-255 at 5939 S. Lindbergh Blvd., St. Louis, MO 63123.